A gang of puppy farmers which sold hundreds of dogs kept inside cages on a farm has been spared jail. The group advertised the pets - which they sold to unsuspecting members of the public for an average of £450 - as "home-reared". 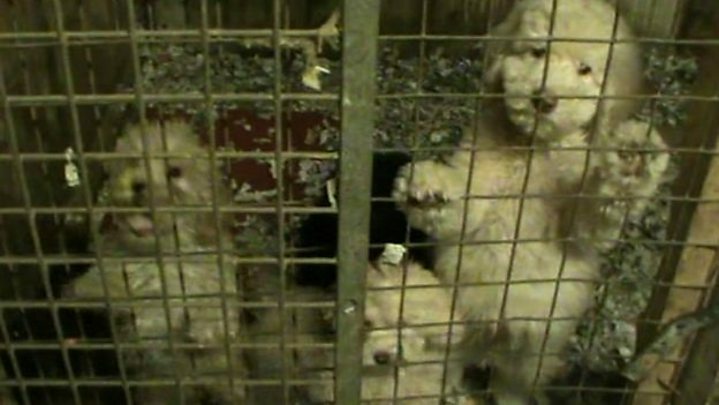 They handled about 750 puppies as part of the "sophisticated enterprise" which was worth up to £500,000, a court heard. Each gang member was given a suspended jail sentence at Basildon Crown Court. Teresa Wade, 57, Victoria Montgomery, 54, her daughter Roxanne Montgomery, 33, and Tony Hammond, 34, were convicted in October. During sentencing, Judge David Owen-Jones heard how the animals had been advertised online as being home-reared but were actually kept in cages in dark sheds. Three of the dogs died, four more were put to sleep and others suffered serious health problems. One of the dogs was "vomiting worms", some of its fur fell out and it had blood in its faeces, the court heard. Since their conviction, the court heard, Wade had been involved in a car crash while Victoria Montgomery was not present at the sentencing as she was in hospital. Judge Owen-Jones said: "It is my view that immediate custody threshold was passed but I cannot ignore the domestic and health issues." Wade, 57, of Ship Lane, Aveley, Essex, was sentenced to 21 months in prison suspended for two years. Victoria Montgomery received a 15-month jail term suspended for two years. Both were given curfews from 8pm to 7am monitored by electronic tag. Roxanne Montgomery, 33, of Grafton Road, Dagenham, east London, and Tony Hammond, 35, of Brunswick Avenue, Upminster, east London, were both sentenced to nine months in prison suspended for two years. They were ordered to complete 120 hours of unpaid work. All four defendants were ordered to pay £500 each in costs.